Wow Union Bindings are sooo good this year, they have continually been getting better every year with new technology. The Union team is one of the best in the Biz so they must be doing something right. 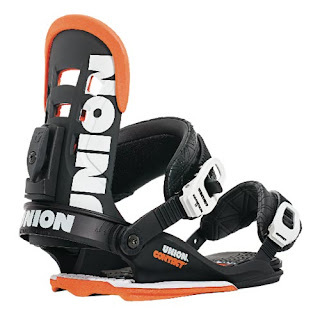 We have a bunch of great bindings from Union especially the Union Contact Binding in Black / Orange. These bindings give you the true meaning of board feel as they have minimal binding to board contact to give you a great board flex. Dual zone EVA padding to give maximum comfort. The Union Contact Binding in Black Orange is a great binding to pair up with The Capita Horroscope, or anything other amazing board from Capita. These retail at the great price of $178.99.